On the eve of the end-of-year holidays, here is a recipe that is renowned in France for its excess-fighting qualities. Ah oui, mes amis — once the festivities are over, it’s time to take action to counteract the effects of all the wonderful holiday dishes, sweets and drinks we may have indulged in. Rustic cabbage soup is the antidote. In fact, it is an open secret among French women and men who want to start the new year in their best form. You may notice potatoes in the photo above. They are optional. Purists will omit them during the lean-and-mean slimming period. And that period can last for up to a week. Cabbage soup for lunch and dinner, possibly supplemented by lean meat or fish — this is the French miracle method for battling holiday excess. It must be noted, however, that this is also a classic French soup that can be embellished with cream, grated cheese, croutons, or all of the above. A fine winter’s meal, preferably served by the fireside. Before leaving you for the holidays, I’d like to mention an amusing article that appeared in The New York Times this week. It’s a list of new words that have entered the food lexicon over the last year. Would you believe piecaken? This multi-layer dessert consists of a pie (or pies) layered — or actually baked — between or inside rounds of cake. For example, cherry pie inside a chocolate cake topped by pecan pie inside a vanilla cake, the whole thing held together by generous amounts of buttercream icing. From this side of the Atlantic, it sounds, well, revolting, but apparently it’s a big fad in the States. If you try it, there’s only one next-day solution: bring on the soupe au chou. This entry was posted in 2. 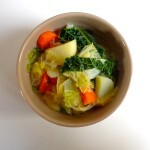 Soups and tagged cabbage soup, holidays, piecaken, recette, recipe, soupe au chou, vegan. Bookmark the permalink. Just made the Soupe au chou tonight. I love cabbage in any form and this was surprisingly flavorful considering how few ingredients. Even without the embellishments very satisfying. This will certainly be a regular in my soup rotation. Jo-ann, many thanks for the feedback! And Happy New Year.